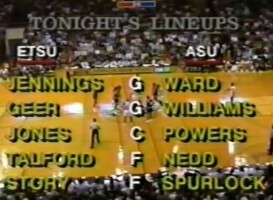 Relive some old ETSU basketball memories with this video against Cincinnati that was played on December 22, 1990. The Bucs start out slow in this one, in fact they get down 10-0 early in the game, but after back to back 3-pointers from Jerry Pelphrey the Bucs start to get on track. ETSU ends up breaking the game open in the second half and beating the Bearcats 90-79. A few interesting notes about this game. 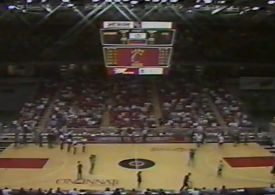 ETSU had just earned their first ever top 25 ranking a few days prior to this game being played in Cincinnati, it was Bob Huggins second season with Cincinnati and it was 1 of 11 non-confernce games that ETSU won that season, which I assume is a school record. As 2012 comes to an end I thought I would post one of the more memorable wins in ETSU basketball history to help ease the pain of a difficult start to the 2012-2013 college basketball season. 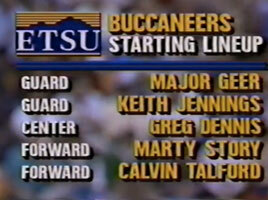 In 1989 Mister Jennings and the East Tennessee State men’s basketball team crushed the Big Orange in Knoxville. ETSU beat Tennessee by the score of 83-70 for the first time in school history. 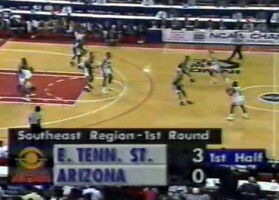 The win established ETSU as the dominate college basketball team in the state of Tennessee for a 4 to 5 year stretch as wins against Memphis and Tennessee followed this game in the next few years. Many Buc fans will recall that Thompson-Boling arena had a large following of ETSU faithful in attendance that night and they were so loud it almost felt like a home game for ETSU. Enjoy! Even though ETSU is no longer in the Southern Conference one of our biggest rivals to me and to many other ETSU fans will always be Appalachian State. The two campuses are only separated by 55 miles of mountainous curvy roads and have been playing each other since 1928. ETSU holds an overwhelming lead in the series but that never diminished the rivalry. Anytime the two teams met it was always one of the exciting games of the season. The visiting team would usually bring a large amount of fans and typically the matchup would end up being one of the largest attended games in the basketball season for both schools. 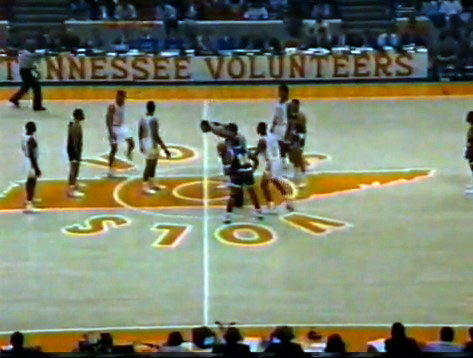 Three of the top 8 crowds in the history of the Mini Dome were against Appalachian State. This game from 1991 was no different. 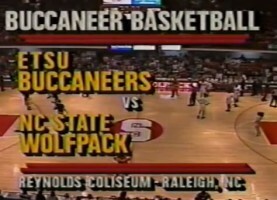 This video is from the 1991 season in a sold out game of over 8,000 inside the old Varsity Gym in Boone, North Carolina. 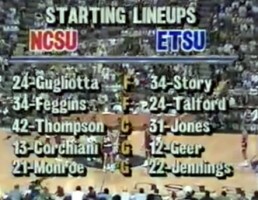 Of course this is the 1991 team featuring Mister Jennings, almost every Southern Conference game for ETSU that season, home or away, was a sellout crowd. See more ETSU basketball games in the video section.